Posted October 2, 2014 . 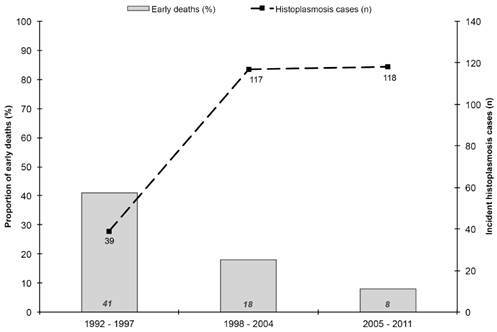 In French Guiana, disseminated histoplasmosis (DH) is the most common AIDS-defining illness (15.4/1,000 person years in HIV patients) and carried the highest mortality. Overall mortality was 45.3%, with a median time to death of 110 days, at an average age of 37 years. But over 20 years (1992-2011), two major changes were seen. The early death rate, before 30 days, fell substantially, from 41% in 1992-7 to 8% in 2005-11. Second, the number of diagnosed cases greatly increased, from 39 to 118 cases in the same time periods. The Mycology/Parasitology laboratory was set up in Cayenne in 1997, which greatly increased culture and microscopy skills locally. Antiretroviral therapy was widely introduced from 1997. In 2006, PCR detection for Histoplasma capsulatum detection was introduced. Treatment shifted away from conventional amphotericin B and fluconazole to AmBisome and itraconazole. Urinary antigen testing is still not available in French Guiana. The authors attribute their improved results to increased awareness of clinicians, who became more aggressive in their investigations, and increased laboratory capacity and skills.